After four and a half years living and working in Malta, Islands of Cats' author Alexander Johnson and the book's photographer and designer Gabriele Ruttloff-Bauer will be moving their domicile back to Switzerland beginning of May 2017 to immerse into new projects. But we'll not be cutting the ropes to the Maltese Islands and just sail away. Our books will still be in the shops in Malta and Gozo, and we will be visiting frequently family and friends. We will continue to blog about stray cats and donate part of the proceeds of each book sold in aid of neutering and spaying of stray cats in Malta and Gozo, contributing to Happy Paws Malta's free neutering program. We would like to express our gratitude to all the wonderful men and women we met during our project research and to everybody who so generously contributed to the making of "Islands of Cats". 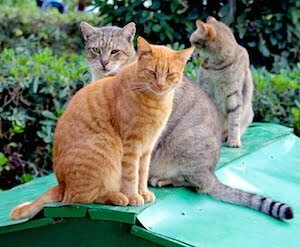 We sincerely hope that the selfless work of the many stray cat carers in the Maltese Islands will gain more public awareness, respect and support. Saħħa !